Is Facebook Messenger The Future Of Your Facebook Page Reach? President Obama recently launched his own personal Facebook page. Welcome to Facebook, Obama! Here at Locowise we do a monthly study of the state of organic growth and engagement of Facebook pages. We analyse the performance of 5,000 different pages and present the results. This way all the page owners can get to know the bigger trends and have a better idea of how well their own page compares to the rest. Let’s take a look at our study for October 2015 and see how much organic reach and engagement Obama and other page owners can expect. 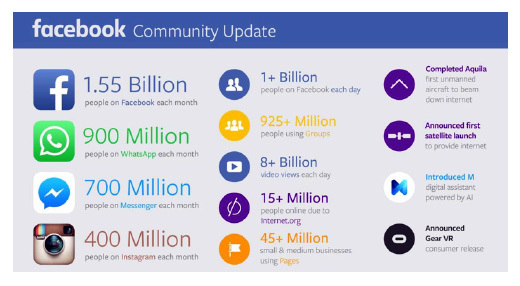 Facebook continues to grow. More than one billion people log onto the platform every day, more than 1.55 billion people are active every month. 1.39 billion of them log on from their mobile phones. There are more than 8 billion video views per day and more than 45 million businesses run Facebook pages. The company made $4.5 billion in revenue in the third quarter of the year. Not everything is positive in the world of Facebook though. The popularity of Facebook Messenger and WhatsApp has created some cannibalisation within the company. We’ll get to that in a bit. Let’s start with the organic growth of the 5,000 pages we looked at. Organic page likes growth in the month of October was at 0.2%. This is a slight decrease from 0.24% growth we saw in September. The largest pages, those with more than one million page likes, are in an even worse condition and grew by 0.04% only. The average post reached 7.25% of page likes. This is 8.34% lower than the 7.91% reach we saw in September. Even here the largest pages performed the worst by reaching only 4.24% of page likes on average. The engagement rate is at 5.87% of all people reached. This is a 4.55% decline compared to the 6.15% engagement we saw in September. Again here the largest pages had a lower engagement rate by engaging 5.6% of people reached. October engagement rate is the lowest engagement rate we’ve seen since we started doing these studies. It’s a 11.2% decline since the month of May, which had the best engagement rate. This engagement decline could be a part of a bigger problem on the platform. Reports show that an increasing number of Facebook users are more likely to just lurk on the platform and less likely to actively post something. 34% of all Facebook users updated their wall in the 3rd quarter of 2015, which is a 32% decline compared to 50% of users who posted in the same period of the year 2014. You might have noticed Facebook testing different reminders and calls-to-action such as “On This Day” to try and entice people to post about different topics and other events. How successful will these be? Only time will tell. One of the reasons for this decline in the posting activity is the growing popularity of Facebook Messenger and WhatsApp. 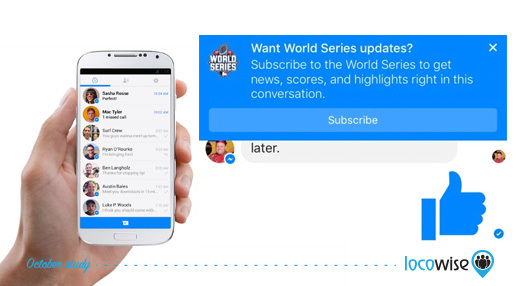 Is the future of your content reach within Facebook Messenger? There are couple of interesting tests underway that could dramatically impact pages and boost the reach of content that pages publish in the future. Facebook is testing a way for people to subscribe to updates about events and other trending topics within the Facebook messenger. Facebook messenger (700 million users per month) and WhatsApp (900 million users per month) combined are used by more people than Facebook itself and this is a trend that will continue to grow as people move to more private conversations. Don’t these two apps compete with each other? Facebook sees them serving different parts of the world. Facebook Messenger serves mainly the US while WhatsApp serves the rest of the world. Facebook is also gradually rolling out a better notification tab in the mobile app for users in the US. It works similar to Google Now and notifies users with timely alerts such as “sports scores and TV reminders, based on Pages you’ve liked”. It is also tailored based on where you are at the moment and can for example show “a list of nearby places to eat, with links to the places’ Facebook Pages and reviews”. These changes could mean that we may soon see a world where more of your content will get seen through messengers and notifications than through traditional news feeds. Videos continued to be the best performing post format with a reach of 9.45%. Links were second best with 8.53% reach, while photos reached 6.84% and status updates only 4.44%. One test Facebook is doing in order to get people to watch more videos is the “Suggested videos” feature. This feature has already been rolled out globally to iPhone users and the company is currently testing it on the web and Android phones. It’s interesting to see the continuous decline of post reach in the 6 month period we’ve been doing these reports. Photos were the most engaging post type with an engagement rate of 6.23%. The second best were videos with 5.98%. Status updates engaged 4.19% of people while links engaged 3.93%. Three of the four post formats have seen a decline in engagement rate since we started doing these reports. You would be surprised when you see which format has actually improved in the engagement. The decline of organic growth and reach = More advertising? 43.41% of all pages used Facebook advertising buying 30.54% of their total reach in the month of October. 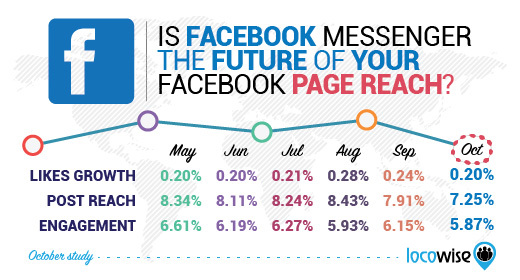 This is a slight increase compared to 42.95% of pages that used Facebook ads in September. 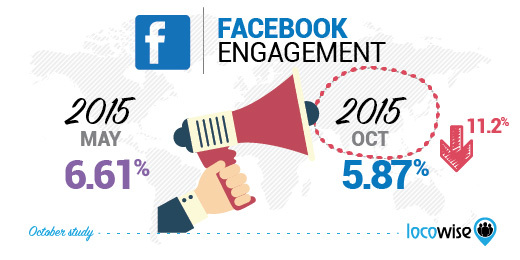 47.83% of the largest pages, those with over one million page likes, used Facebook advertising in October. Here’s the use of ads in the 6 months since we started doing these monthly reports. The decline in organic growth and reach isn’t exactly getting more of pages to start advertising. Take a look at our free tool, Facebook Page Analyser, and benchmark your own Facebook page against the 5,000 pages we looked at in this study. How does your page compare in terms of organic page likes growth? How does your own content reach and engagement look like? It’s a quick and easy process that will give you an idea of how well your page is doing.